(TibetanReview.net, Jul18, 2014) –The Dalai Lama was on Jul 16 accorded a reception by a Muslim group at Leh, capital of the Ladakh region of the Indian state of Jammu and Kashmir. The event was held in the Grand Dragon Hotel by his hosts, the Muslim Co-ordination Committee, Leh. The Dalai Lama spoke about his acquaintance with Muslims since childhood in Tibet. He spoke of his genuine admiration and respect for their religion. The Dalai Lama said the terrorists who carried out the Sep 11 attacks on the Twin Towers in New York City in the name of the religion could not represent the faith. He recalled being told by the then Chief Minister of Jammu and Kashmir, Dr Farooq Abdullah, that Jihad in Islam really meant combating one’s internal destructive emotions and controlling one’s negative feelings. He expressed admiration for the Ladakhi Muslims for their centuries-old tradition of harmony and cordial relationship with Buddhists as well as within their own community. 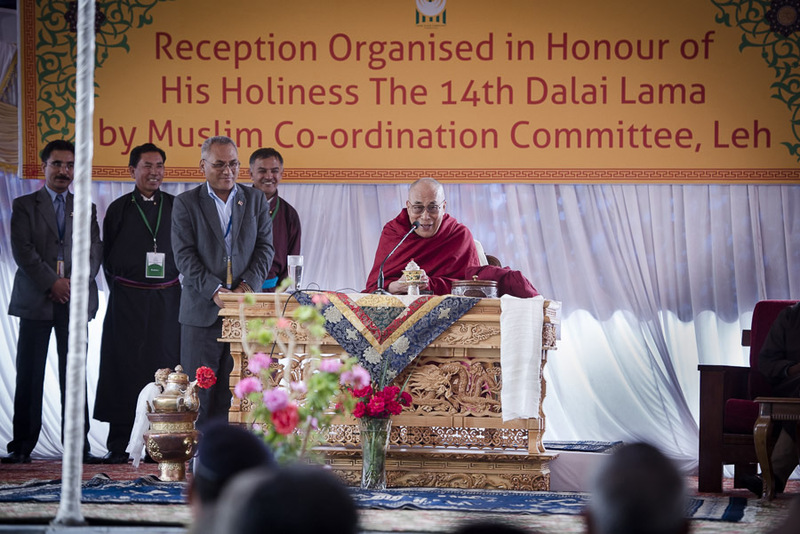 Sheikh Saif-u-din, the President of the Moin-ul-Islam, expressed gratitude to the Dalai Lama for his advocacy of interfaith tolerance and harmony and for gracing the occasion despite his busy schedules. Ashraf Ali Barcha, the President of the Anjuman-e-Imamia, also thanked the Dalai Lama for his visit, calling him an apostle of peace and his visit to Ladakh the most blessed and a very happy moment for all the Ladakhis of all religions, reported groundreport.com Jul 16. The Dalai Lama was in Ladakh to mainly confer the Kalachakra empowerment which took place from Jul 3 to 12 and which was attended by around 150,000 people, including people from more than 60 countries.